Blender is one of a must have tool in kitchen. It is very useful for mix ingredients and puree food. It has 2 main parts, Blender base and glass bowl. Even we call it glass bowl but it can be made from plastic or stainless steel. On top of bowl is a lid to prevent mixed ingredients to pop up during blended operation and at the bottom is a replaceable blade. As for general purpose blenders comes with minimum tools, replaceable blade and main base. But there are some more advance blenders has high performance and higher price. Most of the blenders have from 300 to 600 watts, but sometime blender with 1300 watts is needed for some purposes. 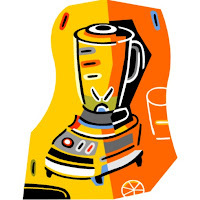 If you plan to buy a blender, try to remember to consider choosing the right color, and size of the blender. But you should have no problem finding one, because usually one model type of blender has a lot of design and color. It is believed the first electrical blender invented by Dr. Oliver Johnson Schofield, an English engineer in 1921. To make smooth purées of semi-solid ingredients, such as for creating mesh cassava. To help dissolve solids into liquids. Food dye as your needs. Peel Cassava, cleanse it, and slice it dice. Boil it until tendered. Serve it for 20 people. Take it while it hot, blend it until soften with blender. Cook sugar, water and vanilla until sugar melted. Pour it into Cassava. Add grated coconut. Mix well. Add a food dye. Put into dough roller then slice as you need.